Patrick Rothfuss, the fantasy author behind the excellent novel The Name of the Wind, has authored a new Fairy Tale picture book that boldly proclaims it is not a book for children. 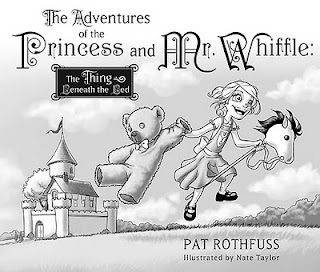 The book is entitled The Adventures of the Princess and Mr. Whiffle: The Thing Beneath the Bed and is published by Subterranean Press. It looks like a children's book. It has pictures. It has a saccharine-sweet title. The main characters are a little girl and her teddy bear. But all of that is just protective coloration. The truth is, this is a book for adults with a sense of humor and an appreciation of old-school faerie tales. There are three separate endings to the book. Depending on where you stop, you are left with an entirely different story. One ending is sweet, another is horrible. The last one is the true ending, the one with teeth in it. The Adventures of the Princess and Mr. Whiffle is a dark twist on the classic children's picture book. I think of it as Calvin and Hobbes meets Coraline, with some Edward Gorey mixed in. Simply said: This is not a book for children. If one were to look up in a fictitious dictionary of "Descriptions that Set Off Christian's Potentially Pretentious Schlock (PPS) Alarm," one would find the above paragraph under the third listing. For those of you who are wondering, the first listing is references to Neil Gaiman (which this violates) and the second deals with references to Alan Moore. Given the book's description above, and acknowledging that it has set off my PPS alarm, I purchased the book in the hopes that Mr. Rothfuss -- who is quite a talented writer -- could deliver a quality tale in a genre where most of the work is drivel. That is to say, most darkly humorous "twists" on traditional children's tales are crap. Primarily because they focus so much on being "ironic" that they forget just how horrifying traditional children's stories can be and think that adding a "dark twist" improves upon -- or is ironically superior to -- a tried and true formula. And then she confessed all her sin, and the executioner struck off her feet with the red shoes; but the shoes danced away with the little feet across the field into the deep forest. And he carved her a pair of wooden feet and some crutches, and taught her a psalm which is always sung by sinners; she kissed the hand that guided the axe, and went away over the heath. Here we have one of the classic fairy tales, told by one of the masters of the "children's" tale, and the girl has her feet cut off and replaced with wooden feet. Not only that, she kisses the hand that removed her feet in thanks for the action. If this tale were to be translated into film, as written, it seems more a Guillermo Del Toro movie than a Disney one. The old fairy tales were filled with gruesome imagery that many modern parents would think is inappropriate for children. I am not one of those parents and my children will receive the full brunt of Andersen's tales. These stories could be as dark as any "dark twist" story, but the classic stories were also rigid morality tales. And this is where most "dark twist" stories differ from their inspiration. Most tales of the modern ironic "faerie tale" variety want the darkness without the morality tale, they are pretentiously cosmopolitan pieces that seek only to be either ironic, shocking, or funny. When they are merely ironic or "shocking," they are typically failures of narrative as the stories lack and underlying heart to them. When they are funny, they can be quite good. It isn't the lack of a morality tale that makes the "dark twist" tale fail -- when it fails -- it is the lack of love for the medium itself. Now that I have expressed some of the reservations that Mr. Rothfuss's description awakened, how does The Adventures of the Princess and Mr. Whiffle hold up? It is clear from the beginning that Rothfuss loves children's stories. It is equally clear by page 10 that he is trying to write a humorous tale for those who like fairy tales. The pattern of event to joke that is established in the first 11 pages is the pattern for the final joke as well. Let me repeat the statement above. This is a tale for those who like fairy tales, though not a tale for those who are just now being introduced to fairy tales. The big joke of the book works best if you have read many a fairy tale and are familiar with all the tropes of a fairy tale. It isn't that the book "isn't for children" in the sense that it would horrify them, or is inappropriate some how. It's just that the book's twist is intended to amuse someone who has read many a fairy tale. The problem is that the joke, while initially amusing, doesn't live up to the hype. It is a chuckle joke and not a coca-cola squirting out the nostrils because it is so funny joke. It amuses, but lacks profundity. Which is too bad because the main narrative of the story, as well as the art work, is quite good. I found myself turning each page eagerly awaiting what new adventure the Princess and Mr. Whiffle would embark upon, or how they would deal with the monster under the bed. Rothfuss is a magical storyteller throughout the book, but the twist falls flat. The basic story is of a Princess who lives alone in a castle and has as a sole companion her teddy bear Mr. Wiffle. The two go on many imaginary journeys with one another during the day, but at night they fear the thing under the bed. The Princess's wild imagination speculates that the creature is horrible and terrible and...You'll have to read the book to find out the rest. There are three ways that Rothfuss could have gone that would have made the book's ending work better for me. First, he could have seriously tackled the horror of what is under the bed. Most children have feared things that go bump in the night and Rothfuss is a good enough storyteller to bring to the page that horror. Second, he could have done a commentary on how cruel children can be when they leave their childhood companions behind. I have trouble reading the final Pooh tale because it makes me despise Christopher Robin. His abandonment of Pooh is quite cruel, as is the abandonment of Puff in that tale. When children abandon their childhood companions in the way that Christopher Robin does, they do more than leave childish things behind -- they leave their imagination and their souls as well. That would have been an interesting story that Rothfuss could easily have written. Third, he could have gone a little bit further with the ending that he did write. We never learn the why of the castle, or the background story. Don't merely give me the joke, use it as an opportunity to continue the tale. Of course, Rothfuss could do this in a subsequent volume in the series and that would satisfy me. The fact that one of my complaints about the ending is that it opens up more questions that I desire answered is a benefit. Overall, I think that the book falls somewhere between the two Kenneth Hite Lovecraftian Children's books (Where the Deep Ones Are and The Antarctic Express) in quality. It has the charm of Deep Ones, but drops the ball a little at the end like Antarctic. Nate Taylor's artwork in the book is excellent, with the exception of the Princess's face from time to time. Her expressions sometimes venture into "anime" style, whereas the rest of the illustration in in a more traditional children's book illustration style. This is a minor quibble as the illustrations are quite fun. In particular illustrations on pages 11,46, and 67. As the parent of two year-old twin daughters, I am always on the lookout for stories that I can share with them. This book makes the cut, for when they are six or so, but its ending prevents it from being in the same league as Jane Yolen's excellent How Do Dinosaurs series. 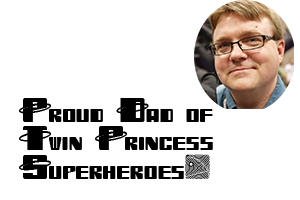 Rothfuss's story doesn't lack heart, but it does fail to answer the question "why?" Why does the twist happen? Just because it is ironic? That's not enough of an answer. I want a world that explains the why. Then we have a tale that can lead to interesting discussions. As it is, we have a story of mild amusement that is well written and illustrated, but fizzles at the end.